Republican Governors Thrilled With Increased Influence In Washington : The Two-Way GOP governors are meeting in Orlando, Fla., this week to discuss how they hope to work with President-elect Trump and with their party's majority in Congress. 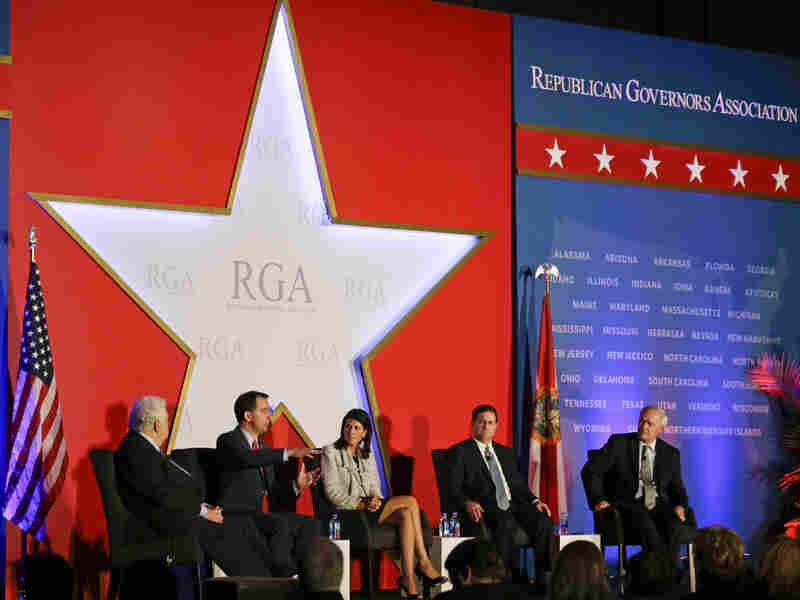 Members of the Republican Governors Association hold a plenary session at their conference in Orlando, Fla., on Tuesday. South Carolina Gov. Nikki Haley said Tuesday the fact that Republicans now control the White House, Congress and so many governors' mansions has left her "giddy." Haley and the rest of the Republican Governors Association are meeting this week in Orlando, Fla., to discuss their party's victories last week and how they hope to work with President-elect Donald Trump. On election night, Republicans picked up three states now governed by Democrats: Missouri, New Hampshire and Vermont. North Carolina's governor's race is still being contested. But even if Democrat Roy Cooper's lead holds and he defeats incumbent Pat McCrory, the GOP will hold governorships in 33 states, the most in nearly a century. That's lent almost a party atmosphere to the conference proceedings, even for governors who had expressed reservations about Trump, like Haley and New Mexico's Susannah Martinez. During the campaign, Martinez said Trump's "offensive rhetoric" raised questions about his fitness to be president. Now she says she's confident Trump will deliver on campaign promises and "his commitment to make sure that America is great again." Haley said she always supported him, despite concerns about his rhetoric. In Orlando, she said "words matter" and she was still watching Trump's statements. "President-elect Trump has done well," Haley said. "I hope he continues to do that. I hope he continues to be disciplined in his comments." Wisconsin Gov. Scott Walker pointed out Republicans had also made significant gains in state legislatures. With a Republican Congress and president, Walker said, "The sky's the limit." Top on his list is asking Trump and Republicans in Congress to return more federal money to the states in the form of block grants. Republican governors say block grants could work for Medicaid and for a Republican replacement for Obamacare. The governors supported Trump's pledge to "repeal and replace" the Affordable Care Act. Florida Gov. Rick Scott warned it won't be easy. "The empire will strike back," Scott said. "The people that make money off the existing system, the people that don't want change, they're plotting every day to try to stop what we know we have to do to turn this country around." Arkansas Gov. Asa Hutchinson injected a note of political realism. "We have to get it right," he said, "because in 2018, I'm up for reelection again." The Republican governors say they look forward to Trump's expected repeal of executive orders signed by President Obama, rolling back environmental and labor regulations. But Hutchinson says in Trump's first 100 days, "He's got to give assurance to our allies and (build) confidence in his leadership." Republican governors are especially upbeat now that one of their own, Indiana Gov. Mike Pence will be vice president and their liaison with the White House. Pence met with his colleagues in Orlando this week and reassured them their voices would be heard in the Trump administration.